The Shure SLX Series wireless microphone systems provide the performance and reliability needed for use in venues, sound reinforcement etc. The UHF system is available in up to 8 different bands, over a 24 MHz spectrum. This system includes the SLX4 receiver, SLX1 bodypack transmitter and WA302 instrument cable. The SLX4 receiver is rack or desktop mountable and features a diversity antenna design. The diversity design allows dual antennas to compete for the strongest possible reception. An XLR microphone level, and 1/4" phone line level outputs are featured. A comprehensive LCD display provides Frequency, Group and Channel information as well as transmitter battery status, audio level and more. The SLX1 transmitter is a UHF body pack transmitter. 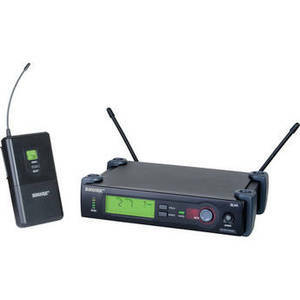 The transmitter is powered up to 8 hours on 2 AA size batteries and features a 4-pin microphone input jack, accommodating any Shure microphone featuring a TA4 connection. The SLX1 features an infrared sensor, allowing the transmitter to remotely sync frequency settings with the receiver. An adjustable mic / 0 dB / -10 dB switch allows input from guitars, instruments and microphones.